FotoZone has dabbled with every possible technique when it comes to classical dance photography, aka Bharatanatyam Photography. Be it capturing the mudras or facial expression or the moment of ecstasy – FotoZone has done professional photoshoots both on stage during live Bharatanatyam performances or back in the comfort of studio. This blog deals mostly with studio photoshoot and also shares the reasons why black and white photography is best for Bharatanatyam. We are also fortunate enough to have a large space with state of the art camera equipments and accessories to help us produce some of the best result. The dancers typically use our studio as a rehearsal ground and this enables them to move freely. When the freedom to move is given to an artist, what else you can expect but poetry in the form of dance! We use such moments to capture sensations and in that process monochromes only add intensity. Black and white photography is known to give a lot of depth on any subject. The reason why many images from the 60’s era still stay in our minds is only because of its intensity and this directly translates to ‘Monochrome = Memory Retention’. When we photography dance moves, especially Bharatanatyam that involves complex facial and hand movements – monochromes adds a lot of subtle details to it. The form of the dancer is made stunningly clear. Just by highlighting the outer surface of the dancers body, you get an amazing visual and that too, impeccably clean. This is especially breathtaking if the dancer does jumps off the floor. The silhouette makes for a great collection both for the dancer and the photographer. 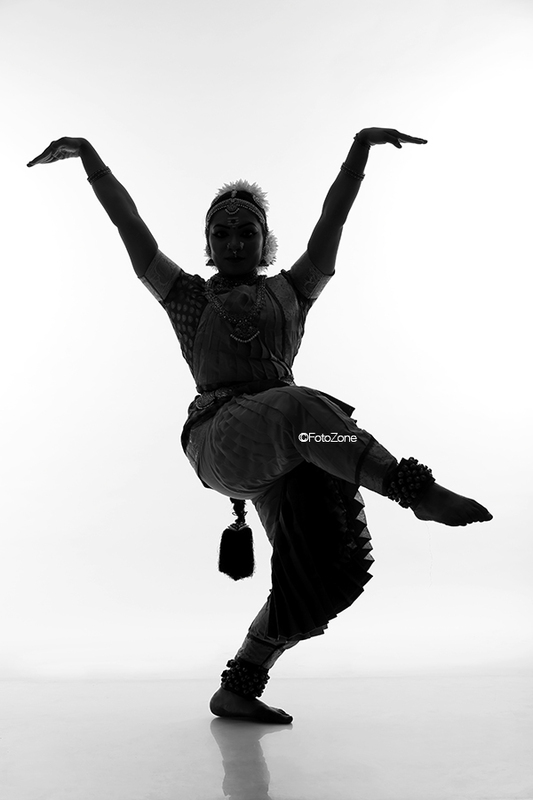 Not many photographers have experimented with black and white with Bharatanatyam photography. There is this common myth that classical dance forms should showcase the colours that the dancers carries with them – which is true but there is always room for experimentation! As a dance photographer, one should be open for experimentation and even clients should be fine if you are open about it. 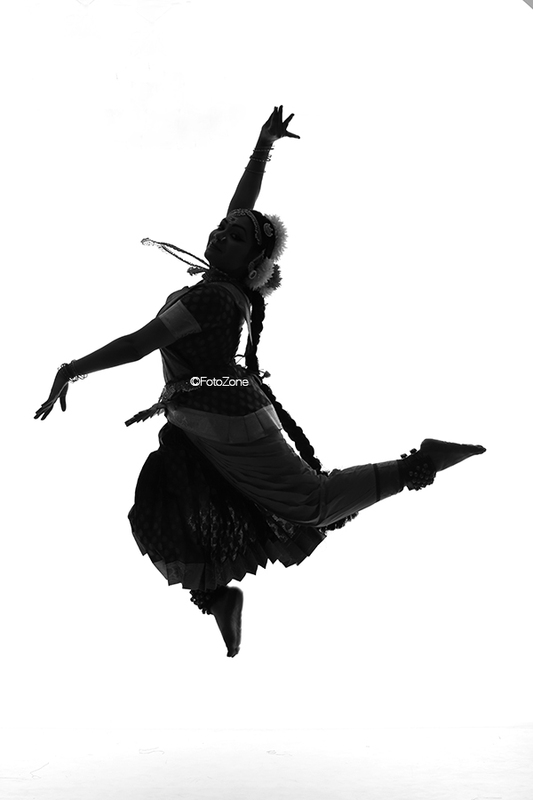 The next big advantage of a black and white Bharatanatyam photography is its less post production resource! Less post production resource is any photographers dream and trust us, monochromes gives you just what you want and also enhances the visual story telling which the dancer tries to portray. FotoZone’s studio is equipped with all the comforts that a dancer would need. Some of the famous Bharatanatyam dancers whom we have photographed will surely stand testimony for this. Our spacious green room provides for comfortable changing and resting, our studio is air conditioned and well equipped to cater to what the dancer wants in terms of imageries. To top it, we have also been named as one of the top Bharatanatyam photographer in Chennai. Now that UNESCO has made Chennai as part of its Creative Cities List for music, FotoZone intends to place Chennai’s map in the field of dance too – and that too with the help of imageries.